One of my favorite comfort foods...scratch that. Start over. One of my favorite foods OF ALL TIME is chicken noodle soup. I still love the condensed Campbell's version from my childhood (don't judge me!!). Maybe it comes from my weakness for all things that evoke nostalgic reactions, or maybe I just love cheap and processed crap, but in the end I guess it doesn't really matter. 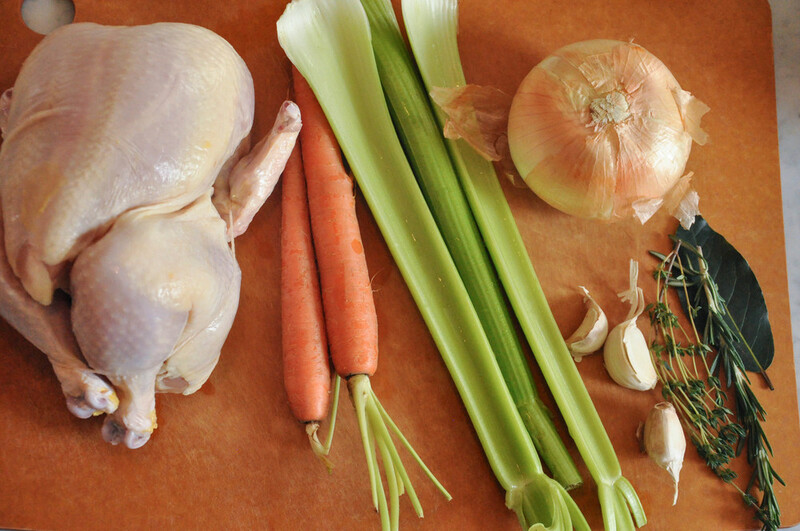 My first memory of chicken stock from scratch was in grad school in Athens, Georgia. My amazing roommate was gifted this beautiful, red Le Creuset dutch oven and I remember seeing her make chicken stock for the first time from a leftover chicken carcass, the smell was heavenly and I was hooked. 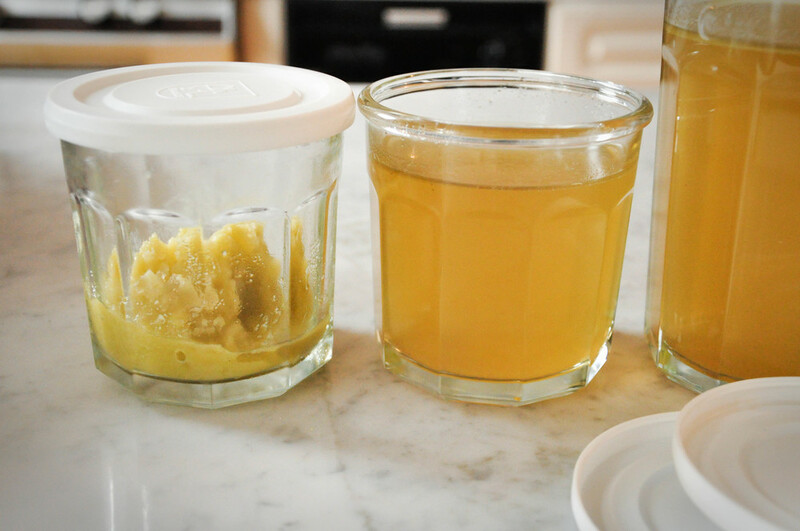 I gave it a go a few months later and I've never purchased store-bought chicken stock since. It's extremely easy although fairly time consuming, but on a lazy Sunday afternoon, what else have you got going on? Being that this is only part I of my three part series on homemade chicken noodle soup, I suppose I should tell you what's coming up next. In part II, I'll make homemade pappardelle for the "noodle" portion, and in part III, I'll be putting it all together. Keep in mind that when you make your own soup, you don't have to go through the entire process that I'm laying out...unless you're as crazy as I am, feel free to pick and choose! I personally like to brown my chicken before throwing in all of the other ingredients as I think it releases more of the flavors...also it just makes the kitchen smell ah-mazing. But if you're strapped for time, you can skip it. Yields 3 to 4 quarts of stock depending on the size of your dutch oven. Sprinkle sea salt (1 tsp) and black pepper (to your liking) on the chicken. 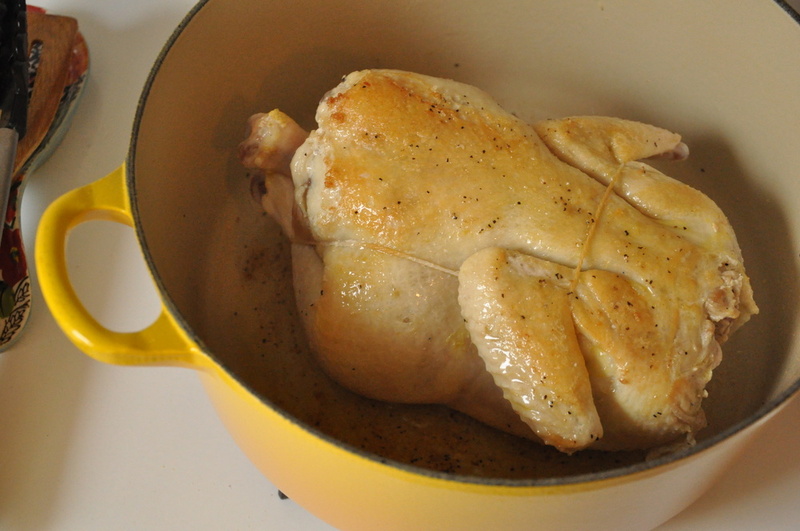 In a large dutch oven, heat up the oil and gently place chicken in. On medium-high heat, brown chicken on both sides, 2-3 minutes per side. Add in carrots, celery, onion, garlic, bay leaf, thyme, rosemary, and enough water to cover the chicken (I used about 15 cups of water for my 7 1/2 quart dutch oven). Bring to a boil then turn down the heat, simmer on low for 4 hours. If the water is reducing too much, add some in periodically. Add salt to taste--you will probably end up using at least another teaspoon. Turn off the heat. Remove the chicken from the pot and let it rest until cool enough to handle. Remove meat and set aside for the soup. Discard the carcass. When the rest of the stock has cooled, strain through a fine sieve and discard vegetables. 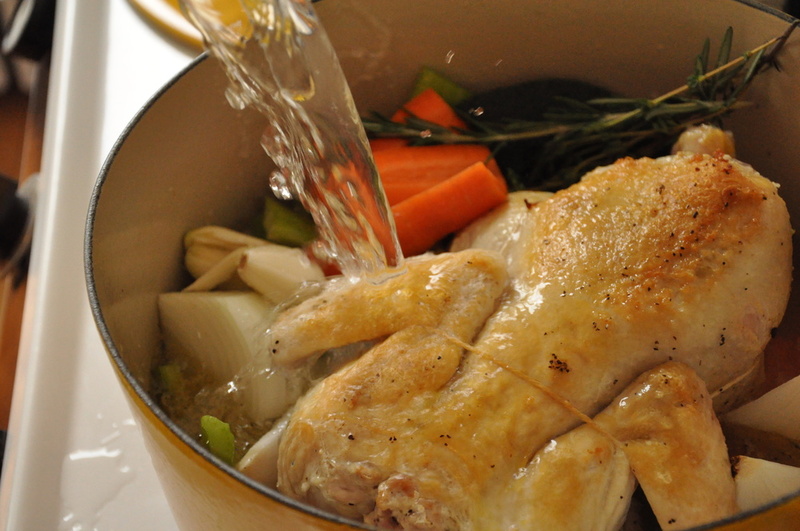 Use your homemade chicken stock as desired! After straining, place stock in the fridge, uncovered. After a day, all the fat will float to the top and solidify, you can then remove the fat solids and store in the fridge for future use.